We had to work for the prime position, though. 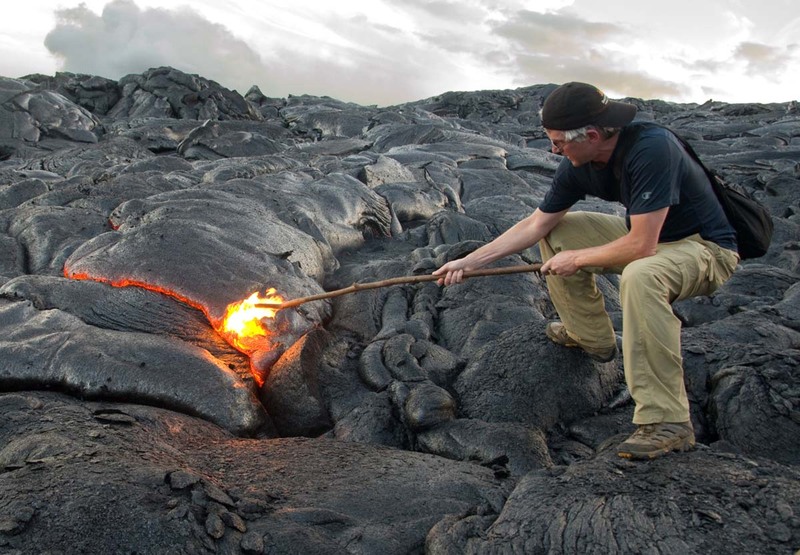 Our quest to rendezvous with the fiery deity had begun earlier in the evening when we met up with a guide from Poke a Stick Lava Tours on the Big Island. 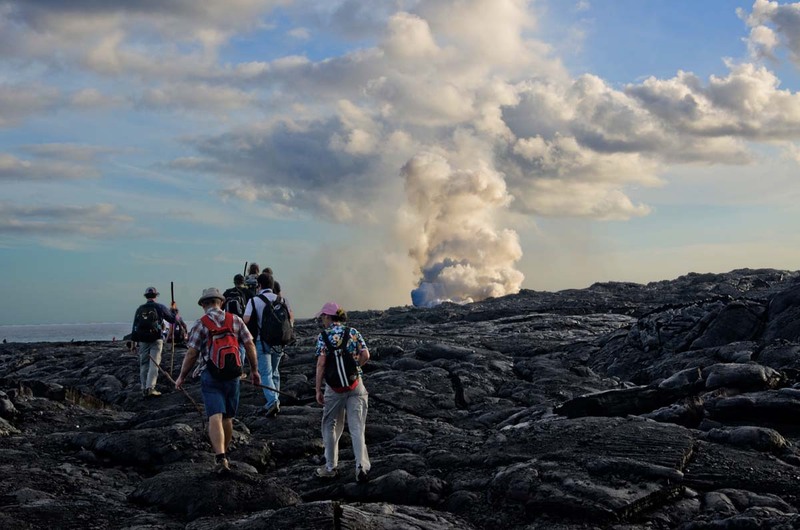 Our group of about a dozen adventure-seekers set out on a 2.5-mile hike across a lava field in Kalapana. Cold, hard, black volcanic ash stretched far and wide, remnants of Pele’s past endeavors. We trekked briskly and carefully across the uneven surface, which sounded like broken glass crunching beneath our feet—and just as sharp, as one of our fellow hikers found out when a sliver slipped into his shoe. As we paused for a break and to take a closer look at the swirling patterns left when the lava cooled, our guide recalled a previous eruption that had sent him racing to help a friend rescue possessions from a house in Pele’s path. We knew we were getting close to the action when heat began to radiate from the surface. The solid, long-dormant lava we had hiked for miles gave way to a living, breathing, blackish-gray substance that oozed across the landscape. Embers glimmered beneath the surface. Our tour company wasn’t called Poke a Stick for nothing. Wielding the long branches they had given us to tote along, we braved the intense heat and prodded the soft blacktop until red liquid emerged—a harbinger of what was to come. When we had enough photos of ourselves poking a stick in the lava and playing with fire, we continued a short distance to the coast for the main event. 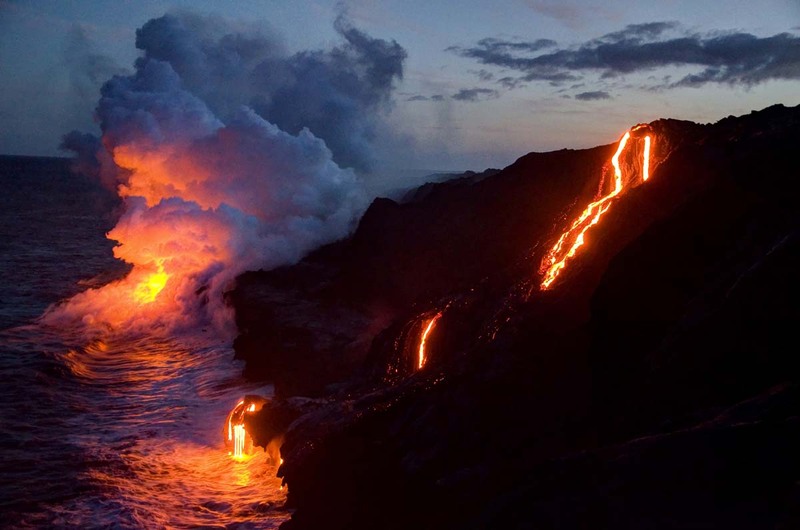 Bright, thin streams of lava trickled down a steep rock face into the ocean, pooling on the wet sand before being washed away by the waves. If there is one thing we’ve learned on our extended travels, it’s that Mother Nature can’t be commanded. We doubted Pele could be, either, and we were pleased—and grateful—with the view. As dusk turned to darkness, we sat on the rocks and watched the show, entranced, as minutes ticked slowly by. 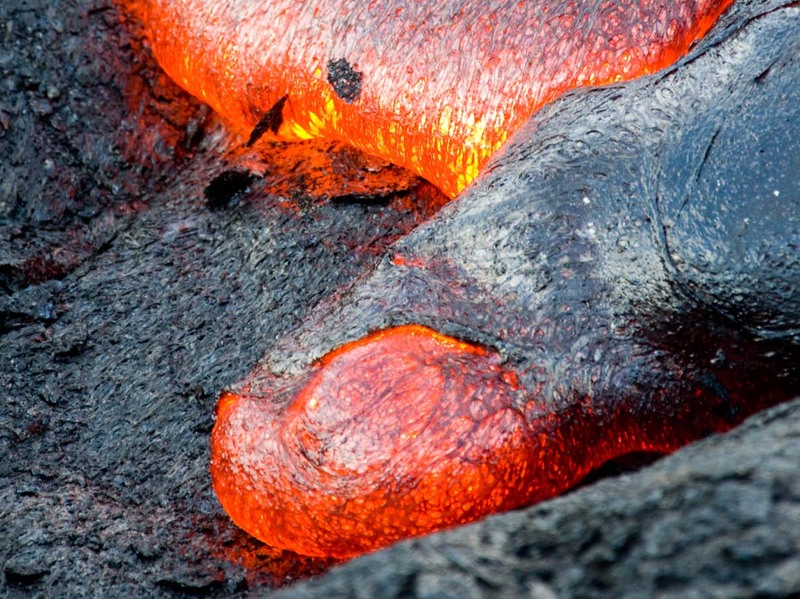 Our patience was rewarded when Pele came through with an even more impressive spectacle. On the hillside above, a lava shelf broke, sending a robust stream of molten rock pouring forth and making way for the sea. All too soon, we had to turn our backs on Pele. There’s a reason lava flow seekers aren’t supposed to set out on their own, and it quickly became apparent why as we headed into the pitch-black night for the return trip. To our inexperienced eyes, there was no discernible path across the open expanse. But even with his GPS on the fritz, our guide expertly led us back across the lava field. Forming a sort of human caterpillar, the members of our group stuck close to one another, each armed with a flashlight that we shone on the heels of the person in front of us to see where they stepped. Although it was arduous going, neither that nor the rain that drenched us could lessen our euphoria after what we had just witnessed. Make no mistake about it, however, this goddess can be fickle. Since our summer visit to the Big Island, where we witnessed her might in action, lava has since stopped flowing into the ocean. Mahalo, Pele, for putting out so magnificently while we were there to see it. Wow, that is truly spectacular, and humbling. Mother Nature certainly cannot be commanded! Stunning photos. No she can’t. And that’s what makes things like this, or animal sightings or other acts of nature, so special to us. You can’t just order them up. To experience them you have to not just make an effort but have some good luck too. I remember reading The Last Day of Pompeii when I was a tween. It had such a powerful effect on me. Good to observe this artifact of nature while remaining safe; terrible to be in its path. Thanks again, I’m pretty sure this is another thing I will never see in person. 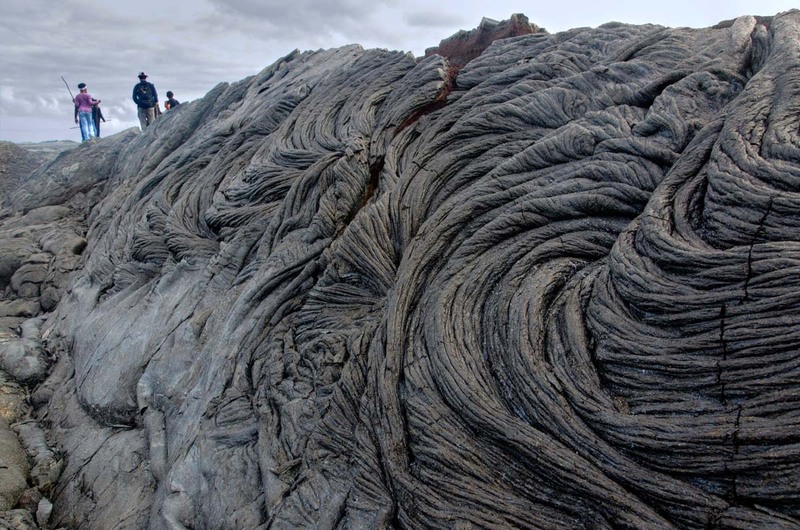 I especially love the photo of the solidified lava flows and the explosiveness of the lava as it meets the sea. Wow, what an exciting trek! Your photos are spectacular. We’ve been on a lot of hikes. And when we go, we always look for some kind of “payoff” at the end. And this really was worth the effort. This is amazing – thank you for sharing. It is something I have wanted to see for a long time and now I feel a little closer to saying I’ve seen it. It truly is a wow. I think this is great set of photo’s of a special place. Thanks for sharing. I agree with all th comments here; truly spectacular. Must get there. Cheers. Crazy! What an intense experience. Wow what an awesome experience and great photos to share. Thanks for this. Wow! Stunning photos and great story! These photos are amazing! I am so glad to see them! I remember hearing about Pele waaaay back and the resulting poem I wrote about it earned me my first A. Happy travels guys! We are watching a series of DVD lectures (Teaching Company) on geology. We are in the midst of volcanism. Your shots of the basalt fields in Hawaii revial their’s, especially the video section. This is definately on our list to do. Thanks Oscar, it certainly one of our favorite travel experiences. OMG, this so impressive and beautiful! How lucky you guys were!!!! Truly magnificent! Envious;-). you were indeed so lucky! i have just returned from a visit to big island and while still impressive it is not flowing. the after sunset glow from the crater was our highlight.great shots, thanks for sharing! 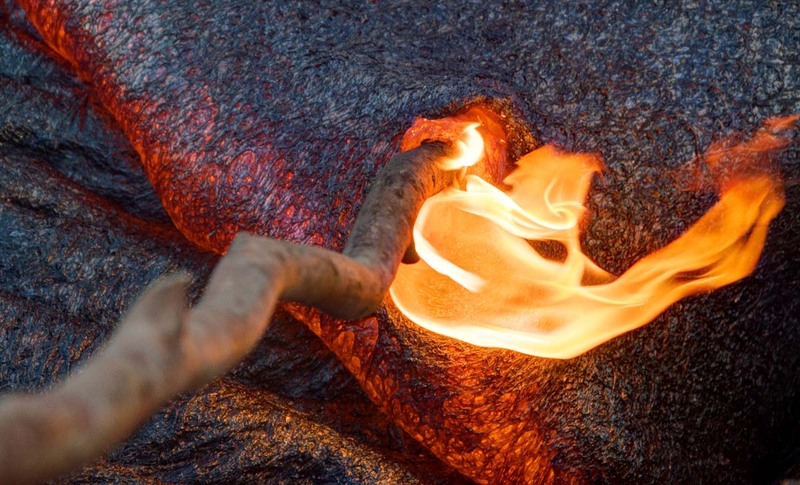 We had read the lava we saw was no longer flowing. Knowing that it could go away at any time made it all the more special. This blog post is quite possibly one of the most ignorant and offensive write-ups I have ever had the misfortune of reading. Iʻm astounded by your lack of cultural awareness. Through this article, you managed to glorify the sexual exploitation and violation of one the most sacred and foundational deities of our people. The next time you want to entertain yourselves, please consider doing so without disrespecting the indigenous people of the place youʻre visiting. A good place to start is by humbly asking a local native, so you donʻt mistreat the culture you are entering. This kindness will benefit you anywhere in the world. I genuinely hope you properly educate yourselves a little more thoroughly next time you visit a new place, so you donʻt end up disrespecting that place the way you did to Hawaiʻiʻs culture and people. If you return here, please educate yourselves first. Mahalo.